CONTEXT: Anterior cruciate ligament (ACL) reconstruction has remained the gold standard for ACL injuries, especially for young individuals and athletes expose to high-level sporting activities aiming to return preinjury level of activity. Femoral cortical suspension devices have gained popularity. However, there are limited studies specifying a superior graft fixation technique. AIMS: To evaluate outcome of arthroscopic ACL reconstruction using fixed closed loop fixation (CLF) and adjustable loop fixation (ALF) techniques. SETTINGS AND DESIGN: Prospective case series. MATERIALS AND METHODS: 40 cases were included in the study, among of which 20 cases, underwent arthroscopic CLF and another group of 20, who were operated on using ALF. Clinical outcome was assessed using manual tests, i.e., Lachman and pivot shift, and results were graded using the International Knee Documentation Committee. Lysholm score was used to evaluate functional outcome up to 6 months. STATISTICAL ANALYSIS USED: Data were analyzed using SPSS version 21. RESULTS: There were no significant differences in manual Lachman and pivot shift grading in both groups. One case (5%) in CLF group and 15% in ALF group were showed Grade B clinically laxity by Lachman, and one case (5%) in CLF group and 10% in ALF group were showed Grade 2 + rotatory laxities by pivot shift. The study found no statistically significant differences in functional score between the groups (P = 0.245). CONCLUSIONS: In femoral fixation of ACL graft both CLF and ALF techniques may provide secure fixation, equal reduction of graft laxity, and similar functional outcome in ACL deficient knee. Anterior cruciate ligament (ACL) reconstruction has remained the gold standard for ACL injuries, especially for young individuals and athletes expose to high-level sporting activities aiming to return his or her preinjury level of activity., Femoral cortical suspension devices have gained popularity because of the simplicity, reliability, and excellent tensile strength. There are limited studies specifying a superior graft fixation technique.,, Multiple biomechanical studies have compared closed loop fixation (CLF) and adjustable loop fixation (ALF) techniques., We evaluated short-term outcome (considered as 6 months) following ACL reconstruction using CLF and ALF. After obtaining approval from the Hospital Ethics Committee, 40 cases were included from January 2016 to February 2017 reported to the Outpatient Department at Army Base Hospital and followed up to 6 months postoperatively. Aged 18 years or above, history of instability or giving way, clinically Grade II or more anterior translation of the tibia over the femur, and ACL rupture on magnetic resonance imaging were included in the study. Exclusion criteria were a previous knee surgery, revision ACL, bilateral ACL rupture, cognitive or language problems, other musculoskeletal involvement in the same limb, multiligament injury; and clinical and radiological established osteoarthritis. Patients who were likely to benefit by ACL reconstruction, underwent pre-anesthetic evaluation. Patients considered fit for surgery were included in the study after obtaining their informed consent. Patients who were unwilling or unable to come for follow-up were excluded from the study. Patients were allocated in a group of 20, who underwent CLF, and another group of 20 who were operated on using ALF by simple random selection. A regional anesthesia was most commonly given. Operations were done by single surgeon. Under tourniquet; in supine position with flexion and valgus force, standard portals are made in all patients. After a diagnostic arthroscopy and confirmation of ACL tear, the concomitant lesions; meniscus tear were dealt at first for which, partial menisectomy was done in six cases of CLF group and eight cases of ALF group who had symptomatic meniscus tear. In all cases, semitendinosus and gracilis autograft was harvested from affected limb, prepared as a four-strand, up to 9.0 mm average diameter. 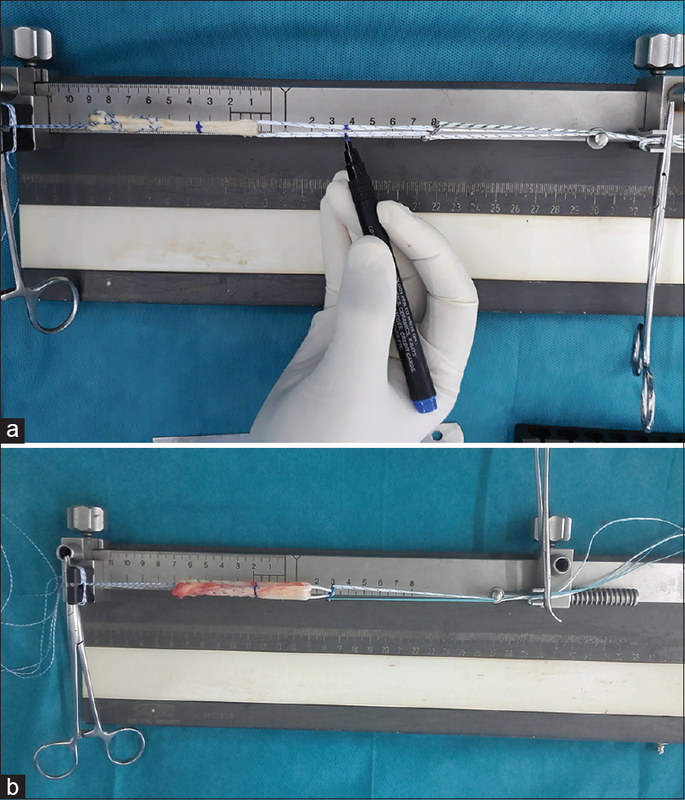 The femoral interosseous distance (flip distance) was measured and marked on the graft loop system over the adjustable graft loop (over suture material), measuring from the tip of the cortical suspensory button, while the surgeon holds the button in a pre-flipped position. During graft passage, when the mark on the adjustable graft loop reaches the femoral socket orifice, this indicates to the surgeon that the button is in position to flip. The Length of the graft to be placed within the femoral socket, marked on the graft. The amount of graft in the femoral tunnel was set at 25 mm, whereas in tibial socket it was set as greater than 15 mm was measured and marked on the graft. The amount of graft in the femoral socket was 25 mm. This distance is marked on the graft itself, measuring from the femoral graft end. During graft passage, when the mark on the graft itself reaches the femoral socket orifice, this indicates to the surgeon that femoral graft tensioning is complete [Figure 1]. According to the size of harvested graft, femoral and tibial tunnel was prepared by transportal technique. With the knee flexed at an average of 90°, the landmarks for a correct placement of femoral tunnel at 10 o'clock (2 o'clock) at level of native ACL were the passage between the notch roof and lateral notch wall and the superior border of cartilage of the posterior part of the lateral femoral condyle. The tibial tunnel was created using a 55° drilling guide introduced through the anteromedial portal. The tip of the guide was placed slightly medial to the center of the intercondylar region, 7 mm anterior to the PCL, on a line joining the inner edge of the anterior horn of the lateral meniscus and the medial tibial spine. The harvested graft was passed through the tunnel and fixed with CLF (Onbutton CL; Biotek, Ahmedabad, Gujarat, India) or ALF (Adjustable loop; Biotek, Ahmedabad, Gujarat, India) devices over femoral tunnel end and with SOFTFIX-PK (polyether ether ketone) interference screw (Biotek, Ahmedabad, Gujarat, India) at tibial tunnel ends. Then, cycling was done. Anterior drawer was performed for appreciating laxity. After securing fixation, knot was tied over metal device using pulley sutures [Figure 2]. Average surgical duration was 43 minutes in CFL and 47 minutes in ALF group. Postoperative rehabilitation was similar for both groups and consists of our institution's rehabilitation protocol. Full weight bearing ambulation and knee range of motion exercises were started within 48 hours after surgery. No rapid recovery protocol or continuous passive motion was applied to any of the patients. Patients were discharged home after 7 days, postoperatively. Patients were followed up regularly in the outpatient department at 12 weeks and 24 weeks. Patients were assessed for clinical and functional outcome. Lachman test (In 25° knee flexion) was used for the assessment of uniplanner stability. The result of manual test was graded using the International Knee Documentation Committee (IKDC) as Grade A (1-2 mm), Grade B (3–5 mm), Grade C (6–10 mm), and Grade D (>10 mm). Pivot shift test was used to describe anterolateral rotatory instability. The result of this test was graded using the IKDC criteria as Grade 0, 1+, 2+, or 3+. Assessment was performed by trained physiotherapist who was independent and blinded to the fixation method used. Lysholm score was used to evaluate knee function and stability postoperatively on the basis of subjective patient response. Data were analyzed using SPSS version 21. Two- sample paired student's t – test was used to compare Lachman and Lysholm scores. Pivot shift was analyzed using paired single-tailed Chi-square test. Demographic and outcome data were shown in [Table 1]. All cases were male. Preoperatively, none of ACL rupture case in both groups was graded as A and 0 using manual Lachman test and pivot shift, respectively. Nearly 85% of patients were of Grade C and 15% were Grade B in CLF group, whereas in ALF group, there were 80% of Grade C and 20% of Grade B, preoperatively. There were no significant differences in Lachman and pivot shift grading in both groups postoperatively. There was Grade B, uniplanner laxity by Lachman test in 5% cases of CFL group, and 15% cases of ALF group, postoperatively. One case (5%) in CFL and 10% in ALF had Grade 2+ anterolateral rotator laxity. The Lysholm knee score was excellent (score 95–100) in 60% cases, good (score 84–94) in 35% cases, and fair (score 65–83) in 5% cases in CFL group, whereas it was excellent in 50% cases, good in 40% cases, and fair in 10% cases in ALF group. There were no statistically significant differences. We presented short-term follow-up study of 20 cases in each group for 6 months. A biomechanical study shows that for first 2 months, point of fixation of the graft to the bone is the main factor affecting the structural strength of graft, and after 4–12 weeks, postoperatively, the attachments to bone are no longer the weakest point in the graft complex as healing has taken place. We believe that this is enough time to evaluate knee stability for graft loosening or re-rupture of graft following fixation. Recently, multiple devices and methods are available for measuring knee laxity objectively. We used manual- Lachman for uniplanner laxity and pivot shift for rotational laxity as the instruments are not available in every clinical setting. To assess knee instability, the most sensitive- Lachman test and the most specific- pivot shift test is most widely used. 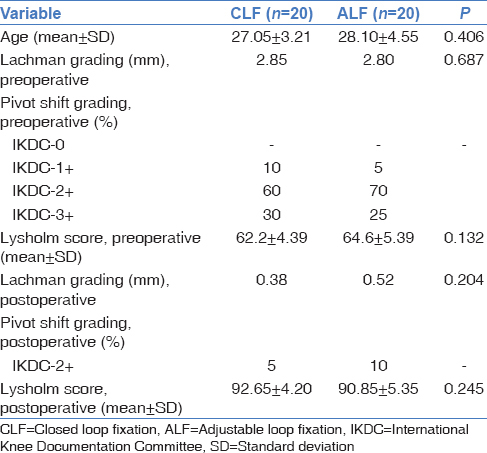 There were no significant differences in Lachman and pivot shift grading in CLF and ALF group. However, one case (5%) in CLF group and three cases (15%) in ALF group were showed Grade B clinically laxity by Lachman and one case (5%) in CFL group and 10% in ALF group were showed Grade 2+ rotatory laxity by pivot shift. This may be result of loosening or slippage of graft. In one retrospective clinical study, rate of clinically lax grafts were 12.5% approximately double in the CFL group compared with 6.1% in the ALF group measured using arthrometer (KT-1000). Mean age and our manual measured results were consistent with this study. There is paucity of clinical published data regarding differentiation of these two fixation techniques. In our experience, the forces required to advance the graft further into tunnel to flip the button were more in closed loop as compared to AL which allows consistently pull of graft to fixation point. These were created less motion of graft within the tunnel. Some biomechanical studies shows that bone in growth of the graft occurs more readily when there is less motion which leads to less tunnel widening and secure graft fixation. An explanation for this is that in CLF, the femoral tunnel required to over drill 0.5 mm length for clearance of the device through femur cortex and flipping which was not encountered in ALF. We believe that this extra length creates greater motion of graft within the tunnel. This hypothesis remains and requires further prospective clinical data to conclusion. In few biomechanical studies, authors were noted that lengthening and slippage of device of AL lead to knee laxity and delayed graft healing. However, loop of AL device allows retensioning after tibial tunnel fixation. We did not experience such outcome in our cases as intraoperatively we have done retensioning of graft after cycling and tibial tunnel fixation. However, there was slight loosening of graft appreciated in all cases of ALF group after application of loading cycles confirmed by anterior drawer, intraoperatively. To overcome these effects, we tied knot over device using pulley sutures in all cases of ALF group to prevent slippage of device. We believe that the advantage is to prevent knee laxity and delayed graft healing after retensioning, but it requires an additional 0.5 cm incision as disadvantage to push knot inside over device. We have not encountered such slippage in graft with CLF device. In one study, they were not observed slippage of graft. However, there is no mentioning about intraoperative loading cycles and anterior drawer after fixation. One biomechanical study evaluates the effects of retensioning and knot tying on the biomechanical properties of an AL device and found that there is an increase in cyclic elongation as compared with CLF during both extended loading conditions which were eliminated by retensioning and knot tying. No clinical study is available on literature search to support knot tying after retensioning of graft to prevent slippage, if encountered after cyclic loading and anterior drawer intraoperatively. Graft re-rupture rate was 8.7% in the CFL and 4.7% in the ALF group in one study. However, results were not statistically significant. We did not find any re-rupture of graft on magnetic resonance imaging which was done in those cases showing Grade B laxity by Lachman test and Grade 2+ laxity by pivot shift test in both groups, postoperatively. We did not find significant differences in functional outcome using Lysholm score between the groups. Results were consistent with a published study. Strength of this study was prospective design, and single surgeon performed clinical study comparing clinical and functional outcome of ACL reconstruction using CLF and ALF techniques in ACL deficient knee as most of earlier discussions are based on biomechanical studies. We believe that these data may help in subsequent studies. No prospective clinical data exist regarding clinically lax graft rate although it was not significant in our study; therefore, objectifying measurements with other methods warrants further evaluation. The graft motions within tunnel after fixation and effects of knot tying over device after retensioning require future clinical investigations. A large sample size and longer follow-up are, therefore, desirable so that we may have more complete set of outcome data to obtain significant differences if any. Inclusion of control group would improve the study. Hewett TE, Di Stasi SL, Myer GD. Current concepts for injury prevention in athletes after anterior cruciate ligament reconstruction. Am J Sports Med 2013;41:216-24. Musahl V, Becker R, Fu FH, Karlsson J. New trends in ACL research. Knee Surg Sports Traumatol Arthrosc 2011;19 Suppl 1:S1-3. Saccomanno MF, Shin JJ, Mascarenhas R, Haro M, Verma NN, Cole BJ, et al. Clinical and functional outcomes after anterior cruciate ligament reconstruction using cortical button fixation versus transfemoral suspensory fixation: A systematic review of randomized controlled trials. Arthroscopy 2014;30:1491-8. Kamelger FS, Onder U, Schmoelz W, Tecklenburg K, Arora R, Fink C, et al. Suspensory fixation of grafts in anterior cruciate ligament reconstruction: A biomechanical comparison of 3 implants. Arthroscopy 2009;25:767-76. Kleweno CP, Jacir AM, Gardner TR, Ahmad CS, Levine WN. Biomechanical evaluation of anterior cruciate ligament femoral fixation techniques. Am J Sports Med 2009;37:339-45. Petre BM, Smith SD, Jansson KS, de Meijer PP, Hackett TR, LaPrade RF, et al. Femoral cortical suspension devices for soft tissue anterior cruciate ligament reconstruction: A comparative biomechanical study. Am J Sports Med 2013;41:416-22. Johnson JS, Smith SD, LaPrade CM, Turnbull TL, LaPrade RF, Wijdicks CA, et al. A biomechanical comparison of femoral cortical suspension devices for soft tissue anterior cruciate ligament reconstruction under high loads. Am J Sports Med 2015;43:154-60. Malanga GA, Andrus S, Nadler SF, McLean J. Physical examination of the knee: A review of the original test description and scientific validity of common orthopedic tests. Arch Phys Med Rehabil 2003;84:592-603. Rodeo SA, Arnoczky SP, Torzilli PA, Hidaka C, Warren RF. Tendon-healing in a bone tunnel. A biomechanical and histological study in the dog. J Bone Joint Surg Am 1993;75:1795-803. Lefevre N, Bohu Y, Naouri JF, Klouche S, Herman S. Validity of GNRB® arthrometer compared to telos™ in the assessment of partial anterior cruciate ligament tears. Knee Surg Sports Traumatol Arthrosc 2014;22:285-90. Prins M. The lachman test is the most sensitive and the pivot shift the most specific test for the diagnosis of ACL rupture. Aust J Physiother 2006;52:66. Wise BT, Patel NN, Wier G, Labib SA. Outcomes of ACL reconstruction with fixed versus variable loop button fixation. Orthopedics 2017;40:e275-80. Noonan BC, Dines JS, Allen AA, Altchek DW, Bedi A. Biomechanical evaluation of an adjustable loop suspensory anterior cruciate ligament reconstruction fixation device: The value of retensioning and knot tying. Arthroscopy 2016;32:2050-9.